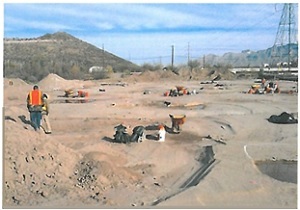 The Paseo de las Iglesias Environmental Restoration Feasibility Study was conducted by the U.S. Army Corps of Engineers (USACE) and sponsored by the Pima County RFCD with the intent to determine a recommended plan and the federal interest in financing construction of the project. This study evaluated ecosystem restoration, flood control improvements, and river park trail development needs and opportunities 7- miles of the Santa Cruz River (SCR) from Congress Street to the Los Reales Road alignment. The study's main objective was to initiate a project that would increase the health and diversity of native riparian habitat within the river corridor and historic floodplain by improving ecosystem functions needed to support native plants and wildlife. Flood control and recreational element objectives supporting erosion protection and river parks were also included. After compiling background information, the study evaluated the feasibility and cost-benefits of an array of ecosystem restoration, erosion protection and river park development options on over 1,100 acres located along the historic floodplain and the west branch of the SCR. Restoring riparian habitat and river functions provide multiple benefits including improved water quality, increased ground water recharge, increased biodiversity, mitigation of the urban heat island affect and a reduction in flood damage. Additional public benefits of the project include a multi-use recreational trail and increased public safety and protection of infrastructure through erosion protection and land stewardship. The feasibility study results initiated activities that helped advance construction of priority elements. The USACE Feasibility Study cost $3.57M, of which RFCD provided $0.84M in cash and $0.95M of in­ kind services. The study's recommended restoration plan established federal interest and was approved by USACE headquarters and the Office of Management and Budget (OMB) however, to date no federal funds have been earmark for project construction. Study results did however provide valuable justification to garner local support that resulted in the approval of $14M in the 2004 bond initiative for Phase I of the Paseo project. In addition to funding the study, money was also spent on many activities that advanced construction improvements. These activities included developing the Concept Design for Paseo Phase I, acquisition of approximately 26 acres of land within the study area, archaeological and cultural resources surveys, and ecosystem restoration and erosion control improvements along the west branch.